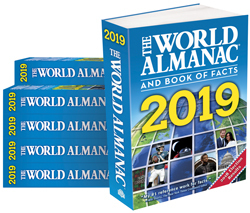 The World Almanac® and Book of Facts 2019 classroom set contains 10 paperback copies of this informative, entertaining reference—perfect for classroom use or circulating in the library. The classroom set will give your students and patrons easy access to The World Almanac®'s 1,008 pages of essential, up-to-date information with intriguing features such as 2018 Time Capsule, Election Results, Year in Sports, The World at a Glance, The Year in Review, Offbeat News Stories, The Year in Pictures, and much more. Teacher resources are available online for free.